JWmcclin... awesome advice!!! Don't be down, jwmcclin is right, "sometimes life happens and other issues take preference". Keep your chin up! Its going to be ok! Both jwmcclin & Miss Tammie Lee give you some great advice. Stay positive Also keep in mind that honey jars can be long to manifest - even if the signs at the beginning came quickly - just keep working it and have faith (even if only the size of a mustard seed... it can move mountains; as was so wisely spoken in the Bible). Thank you, JW, TMiss Tammie, and Aura. I have an update...will post in a new thread. I got fed up yesterday when I went on FaceBook, and ended up contacting my ex's new girlfriend and telling her everything about him and I - our past, how he is still trying to keep me in his life, etc. I saw that my ex met some of his new girlfriend's family members and I guess I got jealous and lost it for a few hours. I was thinking, "How is that happening and I'm pouring everything I've got into my work?" But, after I did the damage, I remembered that sometimes things take time to manifest. Had a reading just prior to these events...she said it could go either way, that if I want to work things out with him, I need to act within the next month. But that was before I threw him under the bus. 1) People often sabotage their own work. You may have done that with your honey jar. 2) Please don't continue to start new threads on this same topic. We follow you best on the same thread. I have merged your new thread into your older ones. So, I sabotaged the honey jar but not the vinegar jar? Just looking for clarity. Thanks. Didn't realize I should have made all of my "help" questions one thread...I'll re-read the forum posting rules. Second, what i meant was that making a honey jar requires sweet focus and intent, consistently applied but you wrote: "got fed up yesterday when I went on FaceBook, and ended up contacting my ex's new girlfriend and telling her everything about him and I - our past, how he is still trying to keep me in his life, etc. I saw that my ex met some of his new girlfriend's family members and I guess I got jealous and lost it for a few hours." That's not sweet, so it would tend to undermine your sweetening work. That's all i meant. lovealways wrote: I got fed up yesterday when I went on FaceBook, and ended up contacting my ex's new girlfriend and telling her everything about him and I - our past, how he is still trying to keep me in his life, etc. I saw that my ex met some of his new girlfriend's family members and I guess I got jealous and lost it for a few hours. I was thinking, "How is that happening and I'm pouring everything I've got into my work?" But, after I did the damage, I remembered that sometimes things take time to manifest. This is why it is highly recommended that you NOT look on Facebook or other social networking sites to "check up" on your target. I've been guilty of it myself and no good ever comes from it. More times than not, you (I'm speaking generally) end up seeing something that causes you pain and jealousy that sometimes leads to irrational behavior. Irrational behavior almost always ends up derailing whatever progress you have made. Perhaps this isn't the case here but if your ex didn't sound happy, I'd say you may have a long road ahead of you if you want to pursue this further. It is possible that this is the catalyst that breaks them up, but it is questionable if your ex is going to come running back to you even if they call it quits. I'd let things settle for a few days as I'm sure everyone involved emotions are running a bit high and then get a reading on the matter. Their is nothing in the real world you can do, you told her its her issue now. as for them a break up jar to end it, a honey jar to sweeten her to you.. keep in mind of course a reading to see if its even worth it and that a relationship is possible. Review the spell on this link that discusses using Break Up Oil, Stay With Me Oil, Love Herbs Mixture, a red Adam candle, a red Eve candle, and a black Eve candle. You could do some candle work on her using 'Clarity' oil (http://www.luckymojo.com/oil-clarity.html) to get her to see the situation more clearly. You may also want to look at 'Road Opener' and 'Power' oils, to help open a new way for her outside the bounds of the dysfunctional relationship she is presently in, and to empower her to remove herself from that situation. Also, I would not give up on talking with her about the situation and trying to provide some sensitive and compassionate counsel on the matter. Show her you really care for her, and if your love for her is genuine and she is worth your time, then she will eventually realize that. If not, you'll have to move on. As far as working for the break-up and working on her to get her to notice you more: 1) A vinegar jar on the couple, and 2) A honey jar for you and her should both prove to be useful assets. Thanks, Cat and the light. But I think I really did it...we finally talked on the phone today, and he told me not to be upset but he had his attorney send me a letter to not contact him or his girlfriend again because I caused his relationship to have a lot of damage as a result of my email to her and he is afraid of my destructive behavior. My friend who is a therapist says he's just doing. "damage control" because if he really didn't care, he wouldn't have talked to me for 2 hours on the phone. I buried the vinegar jar in a graveyard today, not sure if that help, but should I even keep working the honey jar at this point? You can keep working the honey jar but I think your ex getting his attorney to send you a cease and desist letter is rather telling. I suppose he could be doing "damage control", but I think getting an attorney involved over one email is a rather extreme reaction even for someone trying to save face. You should probably get a reading to see if this situation is even workable at this point. I thought it was pretty extreme myself, but my friend/therapist said that the email I sent was in itself extreme and very damaging because I told her things that he told me in confidence. I was angry and reacted...maybe he did, too. But that was over the top. He did warn me that the email was coming and he apologized. I'll get a reading. Sigh. This is a mess. Is there away to get my ex turned off by other girls? and only to think of me? as his been spending time with this girl awfully alot lately and we only broke up 2 weeks ago, they been friends a while now, and he spent time with her then too, she caused alot of problems for me and i am worried something might develop even tho she says she only likes him as a friend? but she always flirts with him even when we were together, and i just want him to be repulse by others girls apart from me? i dont know what kind of root work this would be, and I am still new to all of this, but really need input. You need to put to yourself the question of why this man is your ex-boyfriend. That's where your trouble lies, not with this other girl. Why did the two of you break up? What would have to change for the two of you to reconcile? Answer those questions and you'll be getting closer to figuring out what sort of rootwork you need. Or, you may want to hire a reader & rootworker to help you since you are new to this work. As others have stated to you and as I have state myself several times, the problem lies not with the girls. Seek the underlying cause of your problem, which you already know, and address it. Well from both of my 2 readings, it comes down to him being faithful which is regards to other girls, so i am asking if there is a thing to repulse him by other girls from him not from girls. I think the honey jar might be working - we aren't on speaking terms right now, but I notice in the statistics report on my website that he has been on there everyday looking, at least twice per day; maybe it isn't as bad as I thought - at least I'm definitely on his mind! I did some back-up work to the reconciliation honey jar (I think the vinegar jar worked a little TOO well since I'm the one who caused a problem by ratting my ex out! Lol) by casting a Chupparosa/Divine Hummingbird spell. I used a pin that went through the "heart" of the candle (which represents the male figure)...the pin never dropped, it just kept going down with the candle as it burned down, and is a part of the remaining wax, which is now shaped like half of a heart (the top of a heart); the female wax residue is the same -half heart shaped. But the most interesting part is that somehow - and I have no clue how this happened, a quarter ended up on the lower half of the male wax residue! Both candles burned at the exact same speed until the very end - the male candle went out about 20 minutes after the female one. Anyone have any thoughts on the pin not dropping (it's not that it was clinging, it just didn't drop at all) and/or the quarter that somehow appeared out of the blue? After doing some Chuparosa/Hummingbird work, I actually received a phone call from my ex!! He called earlier this week, kind of frantically, a few times back to back- about 4 or 5 times. I didn't answer because I was...well, I was confused. On one hand, I'm doing this work that I believe in, and on the other hand, he sends me a letter telling me not to contact him or his new gf, but then a few days later, he called me. Very odd, and I didn't know what to expect. He didn't leave a message, well at least not on purpose because there was a message where I heard some walking and his kids talking, and then the phone disconnected. I did text him 2 days later to ask him if he called me on purpose or accidentally, but he never answered. The candles I was lighting would burn well, and then about the last quarter of the burn, would burn very quickly and leave wax residue that included tears - a few left a crescent moon - once when I lit a candle on the vinegar jar when I still had it, and once this week with one of the pink candles. This last 1/4 of the candle fast burning and residue lead me to do some road opening - I just felt lead to do it. The first road opener candle left some wax residue, and a huge tear going down the side of the jar. The next road opening candle I burned alongside a white one for peace and harmony - sometimes as they burned, they let off black smoke - though the flames were very high - well the flames on ALL candles I burn are high since I started this last month. The wax from these two candles joined together to form....I can't even believe it....a solid orange and white heart! I had to take a photo of it, it was too unbelievable. After that road opening, every candle I burned yesterday on Venus day (pink for romance, red for passion/desire, and purple to command) emitted black smoke when I first lit them, then no smoke followed by a clean burn (well, except the 1st red candle which the wax formed a half heart, and dare I say several things sticking out from the heart that resemble male private parts!). The last two candles I burned last night, red, and purple, burned quietly and just the right time - 4 hours, with no residue. So, I'm feeling much better about this work I have finally completed. I'm not sure what it all means since I haven't had contact from my ex since he tried to call a few days ago, but I will let you all know the outcome. . Last really weird thing, and I wonder if it's the road opening....about 11AM, EST, I kept hearing Amy Winehouse's music in my head, and I kept thinking about her for some reason, and I don't even know her....then I found out 2 hours later that she was found dead....2 hours before! So, I wonder if road opener also leads to clarity/higher levevl of clairvoyance? Kinda freaked out by this! Glad to hear things are getting better! i want my ex and his new beau to break up quick and dispise eachother when they do, any suggestions on what type of spells i should use? Work a Break Up kit on them, and add some Inflammatory Confusion to the mix for extra fighting and confusion between the two of them. If you're wanting to get him back, then I would start a Reconciliation honey jar on he and you right away, so that as he's having a hard time with the ex, he'll be drawn and sweetened to you. However, consider getting a reading to see whether you can successfully break them up, and (I assume) draw the ex back in - and also get some clarity on what you can do to keep the same problems that broke you two up in the first place from re-occuring. Well, today I'm trying to find the energy to feel good. On Monday, I had a very important situation in which I needed to talk with my ex and so a mutual friend of ours called him on my behalf. When I was brought up in the conversation, our friend said that my ex became cold and distant and wouldn't say much about me except that in regards to the situation, that it was my issue to deal with and that he no longer has to deal with those things. I know that doesn't necessarily mean anything, but it did have an impact on my mood. I had a dream about him last night - and I never dream about him - that was a lot more pleasant, so we'll see what happens. The person I had a reading with told me that with persistence, perserverance, and that if I move physically closer to him since we're so far apart, it would help the situation, but it;s also possible that when he's ready to come back, I may have changed my mind out of being too exhausted having waited for him. So I'm just trying to focus on me and keep in good spirits about my goal. Please send good thoughts my way, my LM family! Keep your head up, hun, and I'm sending good thoughts your way. Just remember, whatever is meant to happen will. Take care. Have you gotten a reading on this since the cease and desist letter was sent? I'd probably be paying more attention to the signs (the loud and clear signs) you are getting from your ex, rather than any signs that may be seen from your candle burning. Sometimes we can get so caught up in the spell work we are doing, and trying to see any kind of positive signs from our spell work, that we end up refusing to look at the real life signs that are being given quite directly. I would think that the drippings of a candle would be seen as not "necessarily meaning anything" when compared to how the ex is acting towards you in real life. Good luck to you, but really, it looks like a new reading is in order. Light Fantastic - you're so encouraging. . Thank you. Preppie Roots- thanks for your input. Yes, I actually had a reading before the letter and then after the letter when he called me because his call confused me. The readings were the same, though the last reading also said that he is very angry with me as he feels betrayed because I forwarded emails he sent me while we were together to his new GF. Ok, don't send emails to his girlfriend. Why would you work against yourself like that? It makes him feel like you can't be trusted, you are unstable, and more importantly that you are out to mess up his life. You want him to be drawn to you, not repelled. Don't repeat that behavior. I think you misunderstood me. It was just ONE email 2-3 weeks ago, back on July 9th - I know my story is long and probably hard to follow so sorry about that! That's how my ex and I stopped talking - when I realized that he was trying to still have a relationship with me while he has a new girlfriend, I got angry and I sent her an email telling her what he was doing and within that same email, I put emails in there that he had sent me a few years ago as well as current ones from him so that she could see that I wasn't lying. I think showing her those emails is the thing that made him angry most of all. He did call me once since the big fight - I responded to his call with a text 2 days later but he never answered. So, no, I didn't send several emails, it was just one email - I don't plan, want to, or desire to send her another one - there's no need as I said what I felt I needed to say at the time. While I do understand what you're saying, I think it's hypocritical of him to be so angry with me when HE was the one trying to do dirt (by telling me he loves me and not her but feels "safer" with the new GF so that's why he chose to be with her - yet still coming to me when he needs to talk because *I* understand him and I'm so "different" from other women, he isn't afraid to tell me what he really thinks about anything- right - but he was afraid to tell me he was dating another woman besides me! ), and all I did was tell her what he was doing. I don't understand some men; isn't that trying to have your cake and eat it, too? Anyway, I know I was wrong and that I acted in anger and I shouldn't have done that, especially because we were getting along very well and we were talking everyday (even before I started the honey jar). I really hope he can move past his anger. And I hope you reply because I like to hear men's opinions. I know you asked for ConjuremanAli to reply, but I just read this entire thread. Why would you email his new girlfriend with a forward of something he sent to you? Even if you are on "friendship terms" and you are looking to reconcile, that is a basic trust issue. You can't have a relationship, any relationship without trust. Trust is the foundation.At this point whether or not he is angry is not even the point. It is whether or not he feels he can trust you. Hi, Miss Tammie Lee - I'm glad you replied, too, I didn't mean JUST ConjureMan Ali, I just meant that it's good to hear what the men are thinking sometimes, too! I know I was wrong to do that - I acted in anger. I was angry because while we were trying to be friends in our new situation, he started trying to be MORE than friends and I kept telling him that he was wrong to do that to me and to her. He was trying to be duplicitous in trying to have both of us, and so I felt the right thing to do was to tell her what was going on though I can now admit that most of my reasons for telling her were because I was disappointed, shocked, and outraged at his behavior. You're right about trust. We had trust issues in the past when we were exclusive and it took awhile for us to get past them and get to a good place. They seem to have resurfaced with what I did. So I want it to be understood that I know I was wrong, but no one seems to address the fact that he was trying to hold onto TWO women and sit on the fence. This sounds like a complicated situation! I've read your posts and I know you've put alot of work into this already and I think from what you are saying you would like someone to address the "fact that he was trying to hold onto TWO women and sit on the fence." This is just my two cents so take it for what it's worth. From the way you've described it there really seems to be a power imbalance here. He is trying to romance two women at once, sending you no contact letters, but calling you days later and then not returning your text. Frankly, it seems to me that he wants all the control in this situation. My take is that some of the work may be getting through but his response is to call all of the shots. If that's not what you want, you may have to reassess things. So I think the first thing I would address from a rootwork perspective, is getting some of your own power back. This is for your OWN good. Reconciliation or not, it could only benefit you. First, I would highly recommend doing the full series of 13-herb baths and getting some of the muddy energy off. You will feel so much better after. Then give your house a nice good cleansing with some of the leftover bathwater and some chinese wash.
Second, get yourself some Queen Elizabeth products for some female empowerment. Power would also be a nice addition to this as would Crown of Success, Crucible of Courage, whatever feels best. Off the top of my head, you could baptize a female candle in your own name and do a working empowering yourself, take a series of baths, annoint yourself with oils, etc. I would also consider working with St. Martha and petition her to teach you how to set boundaries and be firm. After, (and the above could keep you busy for a few weeks at least which could only help), assess things, see where they are, get a check reading with a member of the AIRR and see how to proceed. Duchess suggestions are excellent - do a cleansing of yourself and your home and really reassess what you want from this guy. Look at the things he's doing to you out in the open (the letter, etc. ), and ask yourself if this is the kind of person you want to be with in the future. Don't just look at what you used to have, look at what is in the present and what the future may hold if you get back with your ex. When doing reconciliation work, a lot of folks (myself included) tend to focus how our ex was when we were with them and what things used to be like instead of the person our ex has become and how things are now. Women are especially adept to making excuses for men acting like twits. Take it from me - if you let a man push you around emotionally when you're not together, he's going to do the same thing on a greater scale if you get back together. I'm not saying do a cut and clear and move on because you're obviously not at that point yet, but I think it would benefit you greatly if you stepped back and started focusing on yourself. Take the power away from your ex. lovealways, I don't care how many emails you sent, my point stands. Sure he's being unfair, but the fight was a result of *your* actions. Acting in the way that you did made *you* look untrustworthy and frankly off-balanced. If you wish to win in this situation you cannot afford to look like that. In the future do not act in such a manner, be it sending an email or otherwise. So stop defending whether you sent one or more emails and change the attitude that resulted in you acting in that manner. 1. Before church this morning, I was speaking with a relative who is a very successful marriage-family/divorce therapist. That is EXACTLY what she said - that he wants to be in control! You guys are in sync! Lol. 2. After church was over, all of a sudden, I just had this urge to distance myself and concentrate solely on me - I tend to reflect a lot on myself as my work background is somewhat psychologically oriented so I'm always performing self-analyses of my behavior(s), but I mean in a more spiritual way. Like I want and need a retreat for a week or so where the focus is not him, my friends, my family, or my work, but just ME. And then I get home and read the words you guys wrote here! God does certainly work in mysterious ways, doesn't He? Yes, I agree 100% with you both and will be doing all, and maybe even more of the things that Duchess suggested. Thank you so, so much - both of you. Re: Will Break Up Spell Succeed Against Magic-Using Ex? I feel like if this is the case, then why is your rootworker even doing the work in the first place? 1. I would get a second opinion and see if your ex is actually doing magic against you. If he is then his level of skill and what he did to protect himself needs to be assessed. So for example, if he has done magic to protect himself and his girlfriend from any harm, then okay I can see how your work would possibly not work or be effective. BUT if he is a cheater, then there may be other ways to get around it. Now if there was a spell to lure him away with another girl, or lure her away...then you could work around it. In this case, you would have to do some invisibility work to prevent him from seeing what you are doing spiritually. On the other hand, if he has done magic to completely prevent you from doing magic or anyone aiding you in doing magic...then you may not be able to do anything or it may take several magic spells to get what you want. So basically, I would get a second opinion. And sometimes...you may have to wait it out until the person lets there guard down and think you went on to something else. Then come back and attack them. 1) You may not be working with a ethical rootworker. I am not saying this is the case, but non-AIRR rootworkers have been known to build up a scenario like this to get paid for several spells. The "Mars and Venus Spell" you mention is not an old timr conjure spell, so i seriously doubt you are dealing with a worker who practices at AIRR. 2) You need a second opinion. You should also read the secontion on this forum dealing with rreader and rootworker scames, because something tells me you are being taken for a bit of a ride here. 3) Not every case can be won. If your story is true, and does check out, then you may be at a Mexican Stand-Off against your partner, in which neither side can win, and you would do just as well to walk away. tshenley20, you can certainly check with a member of Association of Independent Readers and Rootworkers (AIRR) for workers who perform this type of spell. It would take a reading to get the answers you are looking for. The fact that you sign your name that way is not hopeful. You are undercutting your own power, and a name like "Miserable" or "lost" or "lonely" or "frustrated" is never a good sign for successful spell-casting. That's why i agree with jwmclinton: you need a reading and some rootwork consultation from an ethical root doctor at AIRR to sort this out. Can i get a reading done so I can know if my ex is using a magic spell? (maybe he hacked my phone and figured out what i am doing...again) and the rootworker i spoke to, told me if im that afraid of him finding out im doing this then i shudn't continue the magic. she told me he just put a spell on themselves so they can stay together but that i can do a separation on them and protect against magic so that he no longer can use magic that relationship and neither will i. but do spells wear spells wear off? like eventually ? Some work does wear off eventually. But it depends on what it is . But the work could become less strong if you are not reinforcing some of the work. Brand new here and never used LM products before - but I love the community here, so I thought I'd post my conundrum and see if I could get some insight/assitance with what to purchase before I just go crazy and buy everything in sight. A little background - I have been studying Hoodoo and Santeria for about 6 months now. I am a hereditary clairvoyant/empath who has been led down this path by a good friend of mine who reads tarot professionally. I never believed in spellwork/conjure work before I had a man straight stolen out from under my nose. About 7 months ago I started dating a man who I worked with. Everything was going fantastic - when all of a sudden, out of the blue, a girl has her desk moved closer to him. He starts talking to her more and basically turns against me. I found out he started seeing her behind my back and I ended things with him. The really messy part of all of this is that he and I share mutual friends, and we all work together. I have to see them together EVERY SINGLE DAY OF MY LIFE, and it has been affecting my mental health, along with my work product. I have had work done on my behalf by a referral from a close friend and have gotten candles to burn - but nothing is working. I have seen the work shake up their relationship, and it has definitely brought him back to me to some extent (we have hung out a couple times), but he always goes RIGHT BACK to her. It is seriously as if he is under a spell (I swear, he must be). My objective is to move her out of the picture, remove whatever work she has done to him, and bring him back into my life. Any guidance in this matter and information on which products to obtain is greatly appreciated. 2. In the reading you need to see if she or anyone besides you has or is doing work on him. 3. I would see in the reading if he is even WORTH bringing back considering he did cheat on you, and he did it behind your back. 4. Be open to moving on and finding someone worth it in your life. The same sappy story: I'm in my love with a girl who I was seeing for a few months and as an idiot as I was, I behaved bad with her (didn't care too much). We got into a huge fight and we ended ties, I later find out that within a week she started seeing another guy. We would arrange a meeting six weeks later (still not knowing she was seeing a guy, who by the way followed me home once) and there she blamed everything on me and insisted it was too late now and that he understands her and makes her happy. We have bit of cultural difference as well. I'm a different person and she actually took note in that but I've tried everything in my means to get her back (without burning all of my self-worth). We don't talk anymore and I've deleted all her contact information... supposedly she came to my favorite place (if I'm not busy, I'm there 80% of the time and she knows that and she never ever goes there) in the city after I cut all ties with her, so I'm thinking that maybe it's sign that maybe she does miss me. She's now seeing the guy for two and half months. I am going to get a reading done. What kind of questions should I ask them? Do you recommend anyone in particular? How effective are break up spells? How long do they take? When do you know the breakup spell isn't working when you don't have contact with the couple? Can I do multiple break up spells? Can I do attraction/bringing back love spells simultaneously with them? If lets say it does work... how long does a breakup spell last? I think she has forgiven me, but I need her to really miss and appreciate me again, any ideas? I'm pessimistic and optimistic at the same time. I love her bones, so I'm willing to give it another chance. Re: Breaking up a couple. Get a reading and ask questions like "What are the chances of her and I getting back together in a romantic relationship?" "If I or a rootworker did work to break up this couple, would it have a chance of success?" Look at the readers on The Association of Independent Readers and Rootworkers and pick a person who will undertake break up work; not all workers do that. If the reader says that your chances of getting this lady back to you aren't much good, you'd be best to do a Cut and Clear spell to forget about her and concentrate on drawing new love into your life. But it sounds like you'll need the reader to walk you through all this. I've been interested in performing a spell to reunite myself and my ex-girlfriend. We've recently begun talking again and I love and miss her terribly and she does still love and miss me however she's recently begun to see someone else before we could get a chance to fully reconcile. I was hoping if there was a way to break them up and begin our relationship again anew. I don't wish any harm upon the other guy and I was hoping there was a way that as part of this spell I could bring someone else into his life that makes him happy so my ex and I could be together. I perfer working with candle magic with inscribing and oils so if you have advice along those lines it would be great but all advice will be appreciated! 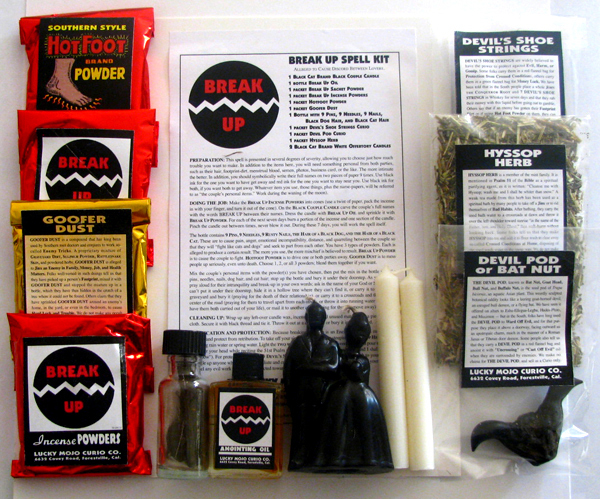 You can purchase a Break Up kit, which has all the candles and oils necessary to break them up and draw your ex back to you. You can also use Separation, which is not as harsh as Breakup. Separation products are a great idea. And you can work a variation on the spell pictured on Lucky Mojo's Break Up page, the one with three figural candles and a pair of scissors. Scroll down to "Break Up / Stay With Me Spells Using Figural Candles." Instead of using a black male candle for the Other Man, you could use a red one -- and another red female candle for his true love, separating the two couples with the pair of scissors pictured here. Thanks I'll have to take all of that under advice, I've already purchased and recieved break-up oil, return to me oil and reconciliation oil as well as a 6" black, white, and pnk candle. What other supplies do you suggest? Well, since you have already purchased supplies for the more usual kind of "leave her and come to me" work, I would only suggest some rose petals and violet leaves to surround your candle and his as they approach each other. How did you mail junk mail?? I want to know what I can do. My daughter's dad and I were fine until he became friends with the girl down the hall. He started to fight with me, now he won't even talk to me or come see his daughter. He moved out of my house and moved into her house. I want him to get out of her house and come back home. I had a reading done and was told that someone who wanted to be with him did some kind of spell on me. What can I do to get him away from the girl she lives on the same floor is me and bring him back home? What can i do to get him to stop talking to her anymore? I believe she's brainwashing him, and I want to know how to fix his anger. Last edited by Mama Micki on Sat Mar 31, 2012 9:22 am, edited 2 times in total. If you believe that this woman did work on him, you can use Uncrossing products or a kit to undo her work. Did you get a reading from a member of AIRR? You can Hotfoot her or do a Breakup or Separation spell on them, but breaking them up won't change his nature, if he is a player or a cheater. His anger at you is also a red flag. He may just be trying to justify leaving you for her. It is often easier to blame the other woman and think of the man as the victim. Usually not the case. It's takes two to tango.